Andrew Wheeler of Highland works past the Pleasant defense for two points in his team’s Tuesday night win. Chase Carpenter was one of four Highland players to score at least nine points in Tuesday’s win over Pleasant. Timely scoring runs and great defensive play led Highland to a 52-41 non-league win over visiting Pleasant on Tuesday night. The Scots took the lead against the Pleasant, who entered the game with a 13-4 record, with a run to end the second quarter. Another run early in the fourth gave them enough breathing room to hold off a late comeback bid by the Spartans. The game was closely-knit for the opening 12 minutes of action. Despite getting a three-pointer by Mack Anglin and a pair of baskets from Chase Carpenter, Highland still trailed 11-9 after the first quarter. 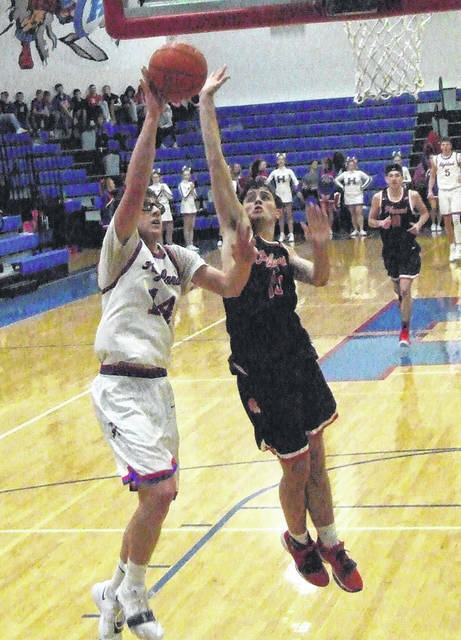 Andrew Wheeler helped lead the team into the lead in the second quarter, scoring five points in the early going of the period to put Highland in front by a 16-15 margin. From there, Anglin, Wheeler and Ty Stiffler all connected from the field to put the Scots in front 22-15. The Spartans got a steal and score from Gage Williams to temporarily stop the bleeding, but Highland ended the first half on a high note with a put-back from Anglin to lead by seven going into the break. The team kept the momentum into the third quarter, as they got two baskets from Carpenter and one shot each from Anglin and Stiffler to lead 32-21 at the 4:56 mark of the quarter. Powell said that his team’s strong defense in the game came from their efforts in preparing for the Spartans. 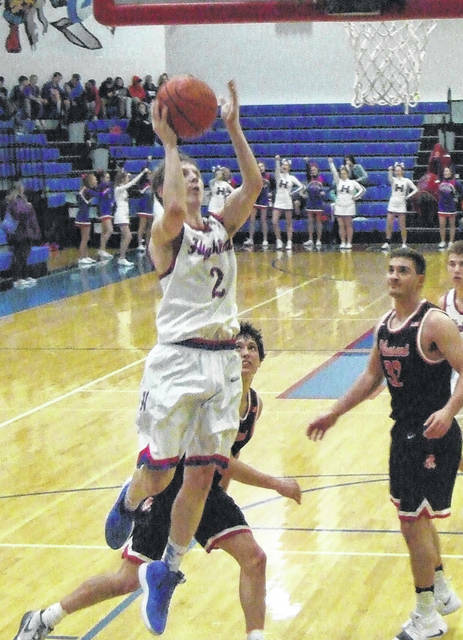 Nick Kimmel scored six straight points for Pleasant to get them within five, but Highland rallied to end the quarter with a basket by Wheeler and a Carpenter free throw to lead 35-27 with eight minutes remaining. Over the first five minutes of the fourth quarter, Highland essentially put the game away. Andrew Wheeler opened the period with a three, but Williams matched that shot for Pleasant. After that shot, though, Highland put up nine straight points with Noah Dado hitting two shots, Anglin connecting from three and Ian Taylor adding a basket. Trailing 47-30, Pleasant was able to score nine straight points, but they still trailed by eight with 1:20 left in the game. Down the stretch, the Scots were able to convert on three free throws in four attempts, as well as get a basket from Wheeler, in finishing on top by 11 points. Wheeler led Highland with 13 points, while Anglin scored 12. Also, both Carpenter and Stiffler finished with nine. As the season has gone on, more and more players from Highland have shown the ability to be one of the team’s leading scorers on any given night — something that pleased their coach. “Success trends confidence,” he said after his squad achieved its eighth straight win in improving to 13-6.